The Dolmen di Sa Coveccada, a megalithic grave found in northeastern Sardinia. Credit: Bettina Schulz Paulsson. Stonehenge is arguably the most famous prehistoric monument in the world. However, not a lot of people know that this megalithic style is far from being unique. There are literally tens of thousands of such ancient sites all across Europe, many of which are thousands of years older than Stonehenge. 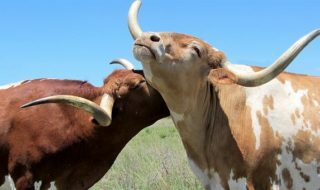 Now, a new ambitious study took on the massive task of finding the common thread among all these sites. The analysis suggests that a single hunter-gatherer culture founded the megalithic phenomenon in the Brittany region of northwestern France nearly 7,000 years ago. The debate surrounding the origin of megaliths can be divided into two trains of thought: either they appeared in a single place then spread across Europe through sea routes or they developed independently by different cultures. 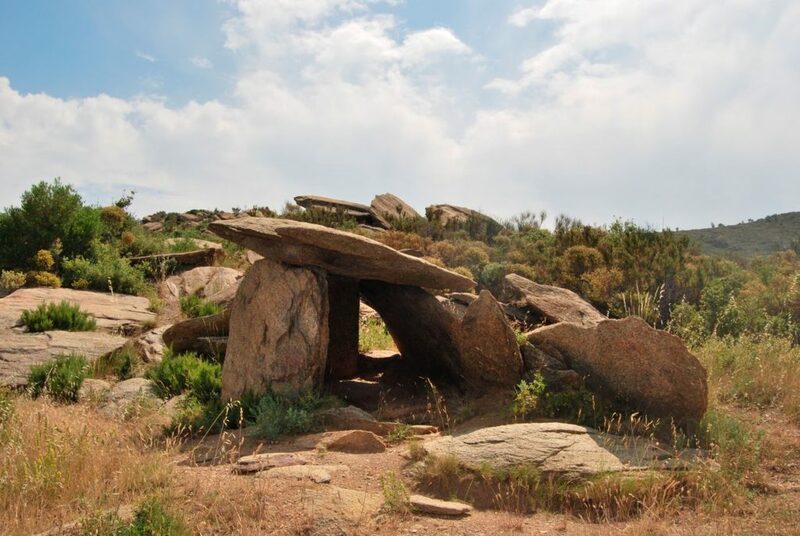 Bettina Schulz Paulsson of the University of Gothenburg, Sweden and colleagues combed through a mountain of archaeological data for 35,000 sites, including standing stones as well as tombs and temples. The research team narrowed their analysis down to 2,410 sites across Europe which had human remains buried within them that had been previously radiocarbon dated. To further narrow the dates, the study also took into account the site’s architecture (some pre-megalithic graves involved elaborate structures but not huge stones), tool use, and burial customs. Finally, using statistical methods, the authors were able to paint a clearer picture of where the first monuments were built and in what order. 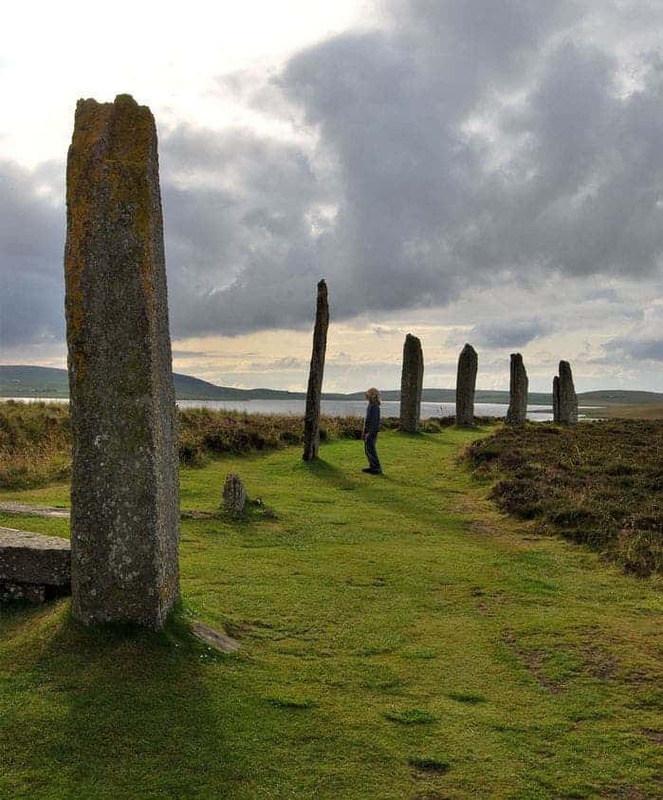 The Ring of Brodgar in Orkney Islands, UK. Credit: Bettina Schulz Paulsson. Dolmen de las Ruines, Catalonia. Credit: Bettina Schulz Paulsson. Dolmen in Goosefeld, Germany. Credit: Bettina Schulz Paulsson. 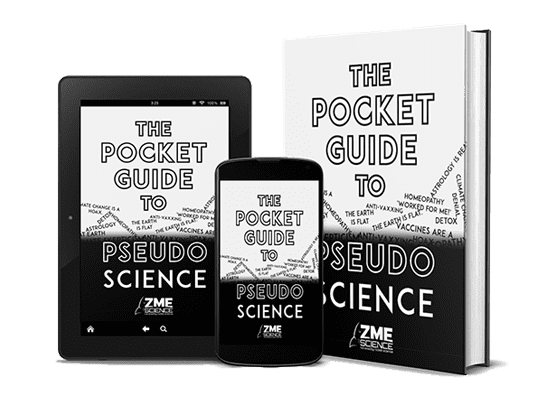 Paulsson found that the very earliest megaliths were in northwestern France — and not in the Near East as previously suggested — dating to about 4700 B.C.E. 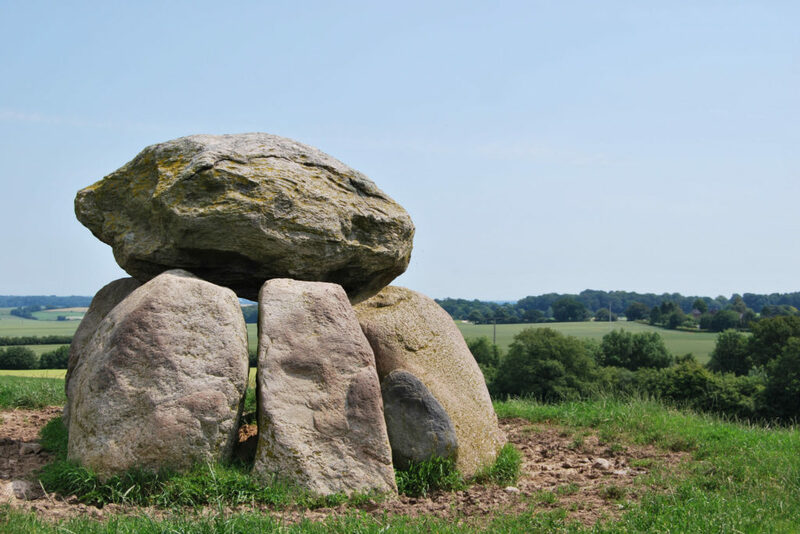 The region is also home to gravesites with intricate earthen tombs that date to about 5000 B.C.E, further cementing Brittany as the origin of the megalithic phenomenon. Some standing stones at Brittany sites depict sperm whales and other marine life, suggesting that these hunter-gatherers were also involved with some kind of sea travel. Some of these early standing stone sites — table-like structures that look like the Greek letter Pi called dolmens — were also some of the largest. For instance, the Grand Menhir once rose more than 20 meters high. 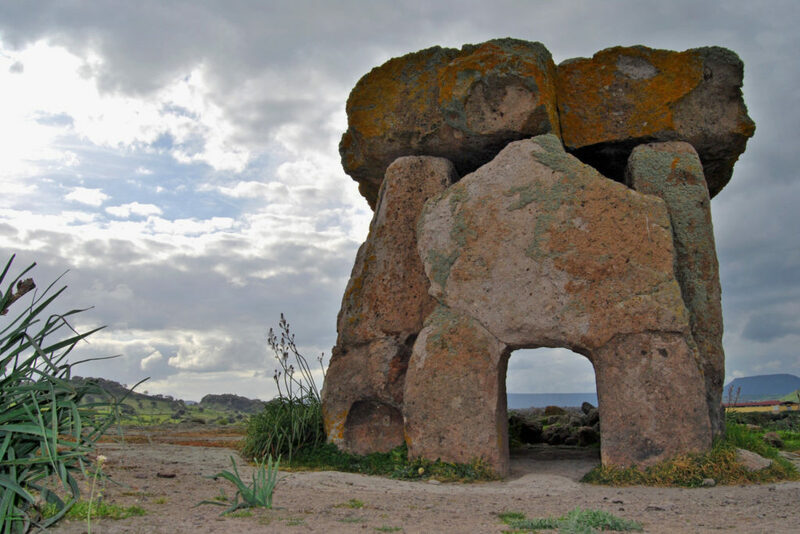 From there, megaliths spread across Europe over the next 2,000 years, concentrating around coastal regions of the Mediterranean and the Atlantic coasts. Stonehenge, for instance, is thought to have been first erected in 2400 B.C.E., although the oldest such structures in the British Isles date back to about 4000 B.C.E. “We argue for the transfer of the megalithic concept over sea routes emanating from northwest France, and for advanced maritime technology and seafaring in the megalithic Age,” the authors wrote in the journal PNAS. 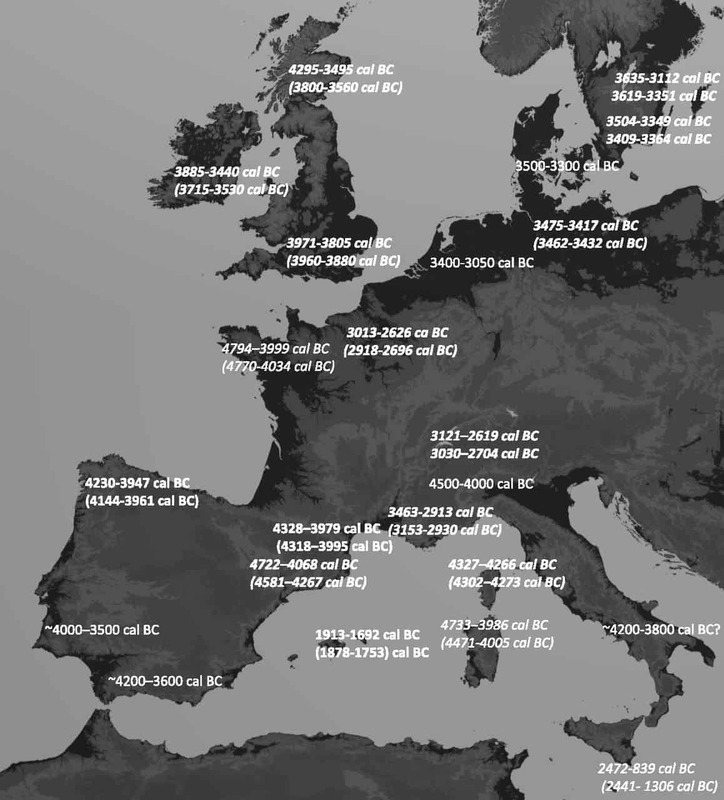 Map showing dates estimated for the start of megaliths in the different European regions. Credit: PNAS. The emergence of the stone monuments around coastal areas suggests that the practice was spread by prehistoric sailors. If this true, then advanced seafaring in Europe could be pushed back by 2,000 years. This is highly plausible: ancient carvings on Brittany megaliths, such as engravings of many boats, are large enough for a crew of 12. Of course, there are many other megaliths that have been either destroyed or not discovered yet — some of them may be older and found in a different location than Brittany. But right now this looks like our best bet. Further studies that also include DNA analysis and ancient population movements might shed further light on these mysterious structures.